...while I soak up our last week of summer vacation. I'll be back in about a week with the start of my Christmas gift tutorials. As you can see, this quilt top isn't finished yet, but I wanted to squeeze in one more baby quilt post this week. After having this idea in my head for months, it was nice to finally get started on it. I have 3 more blocks to add as a top row in order to finish the top for a baby size. 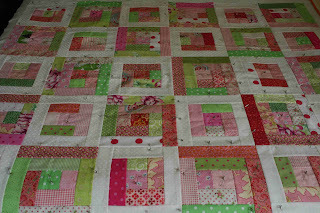 But...I love this quilt so much that I am so tempted to keep going, make it into a lap size and keep it for myself. I am loving the grey and green and white combination immensely. 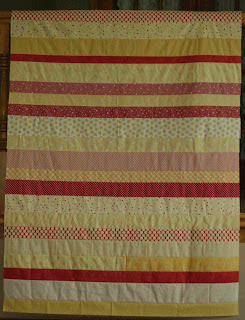 One more link to check out: Trina just finished a sweet little quilt for her adorable newborn. 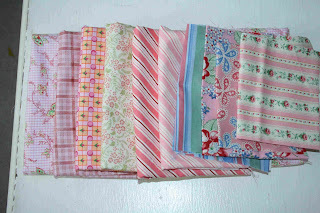 Thanks for all your sweet comments on the baby quilts this week. I appreciate each one. 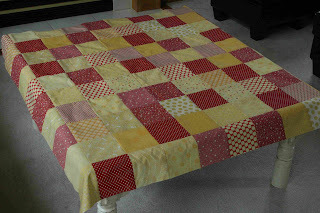 and yellow and red squares-which measures about 45" square. I cut both of these quilts out at the same time in order to be efficient. Anyone else hate cutting?!?! The striped one was not my favorite to assemble. I didn't have many pieces of fabric that were complete selvage to selvage, so there was piecing involved in most of the strips. 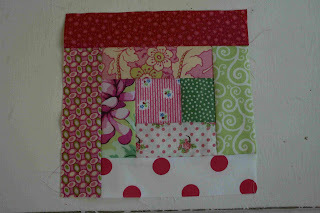 Then, I found it challenging to sew together so I would end up with a rectangle rather than a trapezoid. In the end, it turned out fine, although the photo makes it look a little wonky. I do love the concept and just may have to try this one in pink and green someday. karla recently finished up this 3 year old ufo! 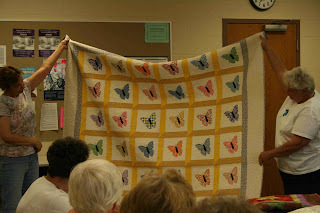 Thanks, ladies, for joining in baby quilt week. If you finished one this week, let me know and I'll add your links in a post tomorrow. 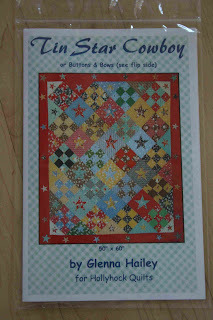 Today's quilt is called Little Bits and the pattern is in this book. I used solids for both the brown and the blue. I liked working on this one an awful lot. 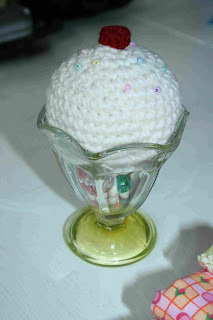 Quick, easy and super cute. I do wish that I would have gotten the little bits spread out a bit more...they are kind of bunchy. 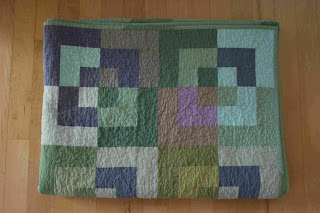 Thanks for all the sweet comments on my log cabin quilt yesterday. 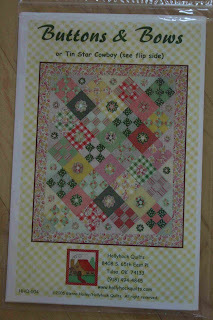 Now, just to clarify, I made the tops for the plain spoken and the log cabin quilts before I started baby quilt week. (I don't work THAT fast.) 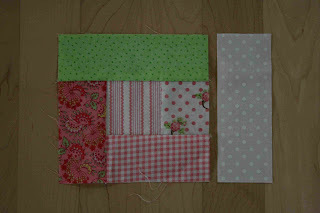 The remainder of the quilts I have started just this week, but they came together fast because they are pretty simple. Sorry if I misled any of you, that certainly wasn't my intention. add a rectangle that measures 2" x 4"
add another rectangle 2" x 4"
add a rectangle that measures 2" x 5.5"
add another rectangle 2" x 5.5"
add a rectangle that measures 2" x 7"
add another rectangle that measures 2" x 7"
add a rectangle that measures 2" x 8.5"
and block A is complete. and you will have block B. 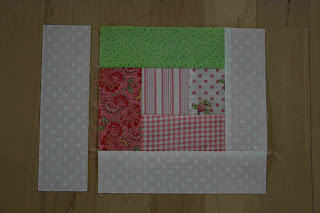 Assemble the quilt alternating blocks A and B. Each block measures 8.5" unfinished and 8" finished. 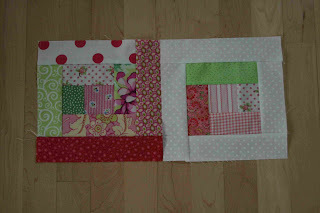 For the baby quilt I made 30 blocks...15 block A and 15 block B. It measures approximately 40" x 48". 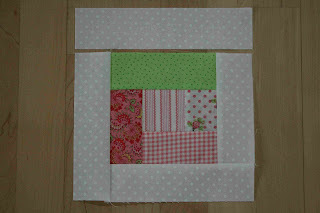 If you make a quilt using this tutorial, please let me know. I'd love to see it. 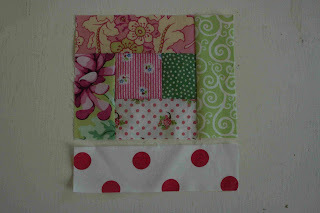 This is a simple Denyse Schmidt inspired quilt. I love the colors. 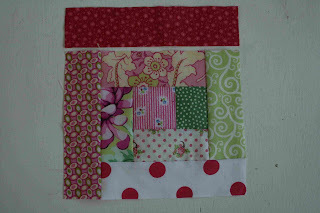 Much like this quilt, I'm relying on the quilting to make it special. I am anxious to see how this one turns out. 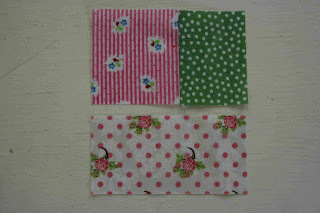 The winner of the fabric giveaway is Shelli. 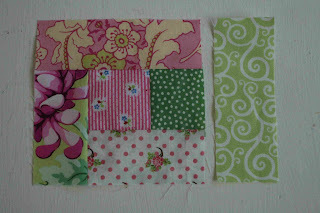 She will be receiving a bundle of green fabric from my stash. Thanks to all of you for playing along. I did pick the winner on Saturday, I just didn't get around to posting it until today. 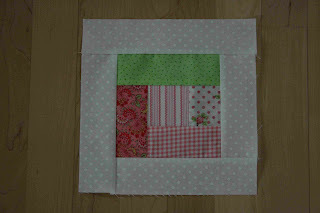 In quilt along news...I have decided (based on John's suggestion) to do a bunch of tutorials to help you with your Christmas gift giving. I have a hefty line up planned. More news on that next week. 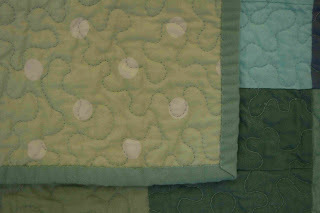 I'm declaring this baby quilt week here at Crazy Mom Quilts. I plan to post a completed baby quilt (top at least) each day. 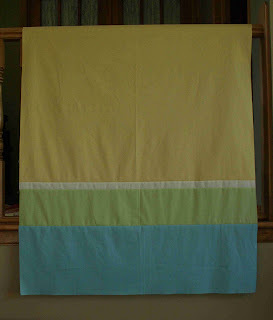 This pattern is Plain Spoken from The Modern Quilt Workshop. 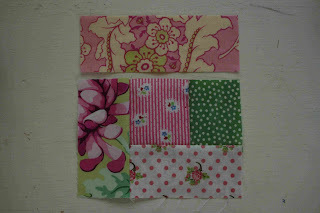 In a personal challenge to myself, I am trying to make several baby quilts for a few reasons. 1. 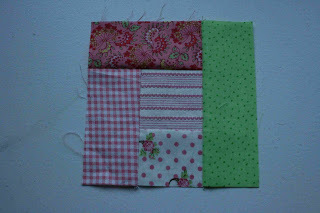 I find it hard to make small quilts. My mentality is, if small is good, big is better. I think it just boils down to selfishness. If it's at least a lap quilt, I can keep it and use it myself. As much fun as that would be, I really don't need that many more quilts. 2. 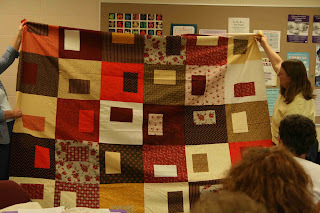 I have a list of quilts that I want to make that is out. of. control. This should be a helpful tool in whittling down my list. At least that's the hope. 3. 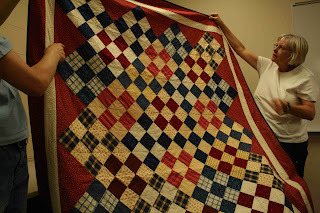 One of my new year's resolutions was to make more quilts for charity. I haven't done very well with that. Yet. 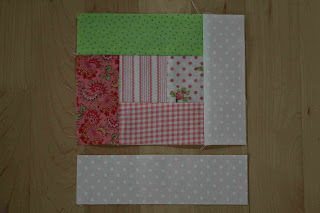 If anyone cares to join me in making a baby quilt (or quilts) this week, I'd love to see what you come up with. 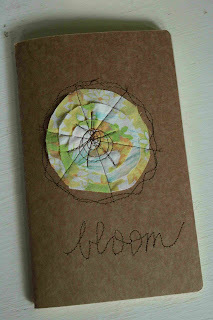 I won a give away awhile back on Glenna's blog. She let me choose one of her patterns, and I loved this one because I can make quilts for both my boys and my girl. It's two patterns in one. Thanks Glenna! and this super sweet pin cushion. Thanks so much Frieda! I love it all. 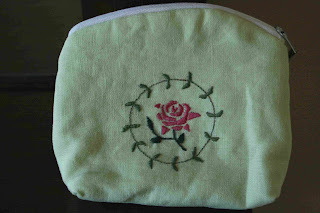 and this cute embroidered zip pouch, which happens to match my needlebook. It will become my little portable sewing caddy for when I am hand stitching the binding on my quilts. Katherine, it's a joy to use such beautiful and well made gifts from you. 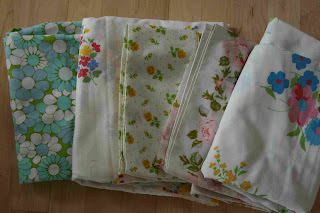 Here is a wonderful assortment of vintage sheets from Lina as a thank you for helping her with some quilting questions. Lina, you've got great taste and thanks for sharing with me! Erin sent me this adorable moleskin just for sending her some vintage sheet scraps. I have got to be one of her biggest fans. I love everything she makes. The moleskin is almost too nice to use...but I did (aren't you proud of me?) start filling it with ideas. I love it, Erin. Thank you. Beth and I did a swap a few weeks ago. 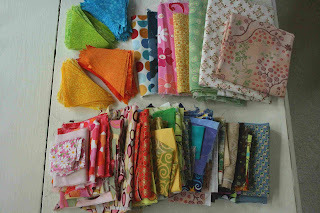 She sent me a lot of fabulous scraps, including a bunch of pre-cut triangles (!!!) and I sent her some red fabric. 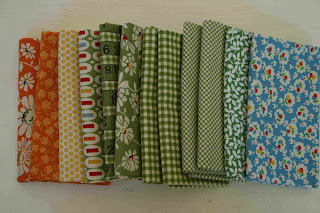 Thanks Beth, for such a fun assortment of fabrics. 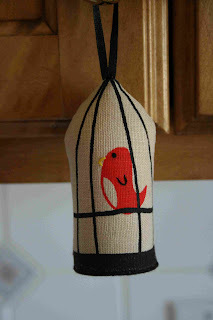 And last but not least, Jodie sent me this adorable little bird cage for her retrospective give away. It cost a pretty penny to send the little package, but I appreciate it so much. My kids asked if they could have it and I politely declined. Thanks Jodie! Thanks so much, to each and every one of you very kind and generous ladies! Now, on to the rest of the reason I am so happy today. My daughter (2 yrs and 4 months) started potty training on her own this week! After almost 8 years of constant diapering in this house (and 2 in diapers at one time for about a year of that) we are seeing the end!!!! YIPEE!!!!!!!!!!!!!! !There's been a lot of yelling and carrying on (in the best possible way) when she is successful. Good times. Good times. 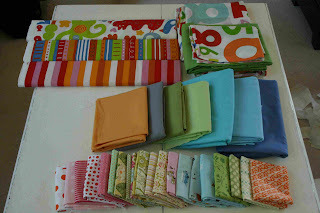 So in honor of all the good mail and all the potty training excitement I'd like to give away a bundle of fabric. Between my new purchases and my generous friends, I have plenty to share. Leave me a comment stating your favorite color or color combination and I'll put your name in a virtual hat. I'll draw a name on Saturday. And thanks so much for reading my little blog. I appreciate it sooooooooo much. After seeing so many fabulous bento box quilts, I knew I had to make one. This one really did me in. 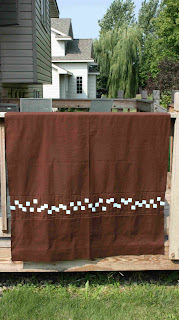 I love what this pattern does with plain solids. All the fabric was from my stash. I was going to try to branch out with the quilting this time, but in the end I chickened out and fell back on my old stand by. 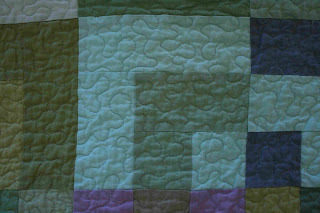 After quilting the vintage sheets quilt so loosely, and being less than thrilled with the results, I took my time and stippled it very small. Each of the center squares is 2" finished, so you can get a feel for how small the stippling really is. I think the quilting alone took me 3 days. It sure makes the quilt nice and bunchy after washing. The backing is something I picked up at Mill End awhile back, and I love it!!! It's one of the main reasons that I am keeping this quilt for myself. 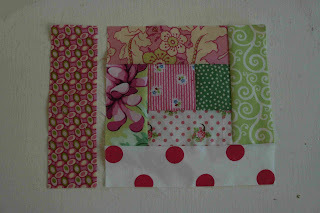 And yet again, I used a pieced binding because the remaining green fabric I had wasn't quite enough. 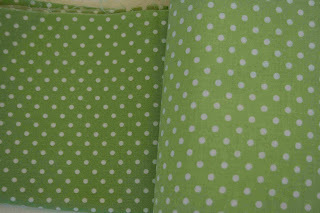 There are 2 tones of green used for the binding. I made sure to limit the colors because I didn't want it to get too busy and detract from the pattern. I love how my fabric diet really pushed me to be creative and use what I have. 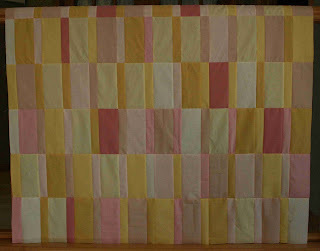 The quilt measures 48" x 72". 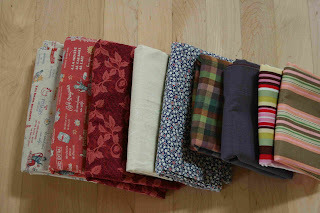 After 62 days of NOT buying fabric, I broke down and added to my neglected stash. We went to IKEA before our trip, which is were I bought the bright fabric in the top row. The number fabric is actually a duvet cover with matching pillow case. I had to have it after seeing this. The solids were on sale at Mill End Textiles. I bought all that (some are 5 yard pieces) in Fargo. The bottom row is from a mixture of stores. The quilt shops that I have been visiting have been having great sales. There is some Heather Ross, Heather Bailey, Sandi Henderson, Joel Dewberry, Moda and some Amy Butler in the mix, among others. 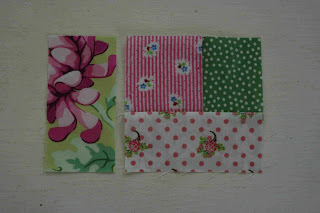 Most are half yard cuts with few fat quarters mixed in. Most of them were on clearance or on sale. And last, but not least, is this exciting find. 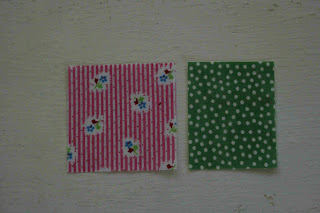 The fabric on the left is Moda from Purl Patchwork. The fabric on the right hand side is a knock off from Wal-Mart. It was $2/yard!!! I bought a the rest of the bolt. I have enough for a few quilt backs and some pajama pants. Woo-hoo. Oh, and I almost forgot this pretty set. One of my local quilt shops was having a fat quarter sale. This stack leads me to believe that I just may become a green girl. Hmm. Never would have guessed. There was so much good about our trip. My husband suggested we paint my dad's living room (it needed it badly) so we did that on Tuesday. What a difference a few coats of paint makes. While we were painting my boys were farming with my brother and my dad and my daughter drug around a very patient little kitten named Fluffy. It was so cute! Wednesday my husband and I left our 3 kids with my very sweet sister and we went up to Fargo, ND (of all places) and had a wonderful night away to celebrate our anniversary. We ate (way too much). And we ate leisurely. Such a luxury after dining with kids for years. We shopped a bit. (I bought new fabric!!!) We had a great time together without the kids. I could get used to that a few times a year, rather than just once a year. But I'll take what I can get. We also met up with Roxanne, and then I proceeded to talk her ear off. It was fun to see her house in person and to hang with her and her adorable daughter for a few hours. 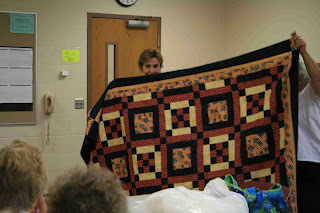 On Thursday night I went to the Prairie Quilters monthly meeting in Long Prairie, MN. 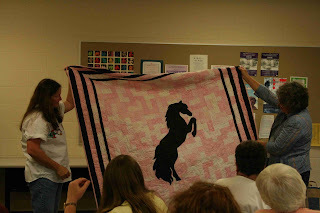 (It's the quilt club that my sister attends.) 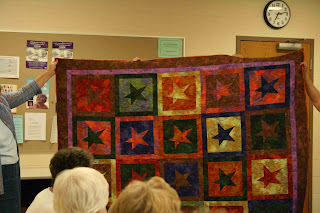 I showed about 30 of my quilts. The women were warm, welcoming and very complimentary. 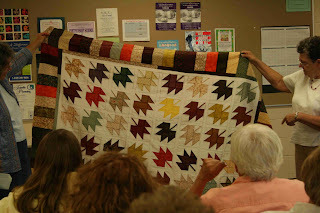 It was a fabulous few hours talking about quilts!!! I was so pumped up afterward that it was hard to sleep when I got home. They did some show and tell, too, and I snapped a few photos. 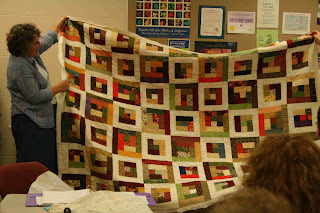 It's always fun to see other quilters and their quilts. Oh, and they gave me a gift certificate to Gruber's quilt shop just for coming to share my quilts. Isn't that sweet? This is my sister's quilt. She's on the left. Sorry there are no photos of me. (I'm shy.) 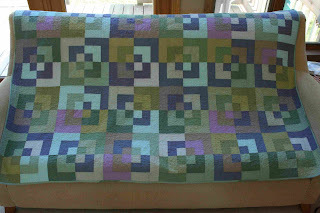 And you've already seen my quilts. 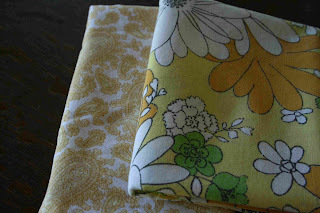 Next post, I'll share photos of my new fabric.